Pull out all the stops on your Super Bowl Party without worrying about your Dallas electrical rates. 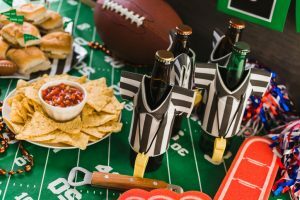 Save energy and enjoy the best game snacks with these great Super Bowl Party ideas! With the Super Bowl almost here, you may be thinking about hosting a party for all your friends. To make sure you put on a party that’s just as memorable as the game itself, you need to pull out all the stops —but without worrying about your Dallas electrical rates. Following these seven tips is a guaranteed way to shine as a host for all your friends, giving them a Super Bowl night they’ll always remember. What Types of Snacks Should I Have? Make sure to coordinate with other party goers on what to bring so that there’s plenty of variety. How Do I Make Sure Everyone Has Fun at My Party? At any Super Bowl party, there are bound to be people who aren’t that interested in the game. Other times, the game can finish before it’s over. Either way, you want to have plenty of other games people can play. That way all your guests can have fun throughout the night. What Kinds of Football Decorations Should I Put Out? At the very least, a few table clothes will make all the difference when it comes to clean up. One on the coffee table and one on the table you’re using to hold all the snacks will make clean up as easy as rolling it up and tossing it into the trash. You can find plenty of other NFL focused decorations if you want to WOW your guests as well. What’s the Best Way to Set Up a Drink Station? If you want to keep your Dallas energy bill low, it’s best to keep people from going in and out of the fridge. Setting up a couple coolers stocked full of party favorite beverages and plenty of ice is an easy solution. Also, don’t hold back. You don’t want to run out of drinks on game day. What Should I do About Seating? You’ll need plenty of room in front of the TV. Clear out any unneeded furniture and bring in extra chairs so people easily sit and see the game. Make sure it’s easy to get around, too. Super Bowl parties are lively. What’s the Best Way to Keep Everyone Safe? Remove anything that may be a tripping hazard or will break into pieces if knocked over. Also, make sure everyone has a safe ride home by posting information about taxis and making sure guests have designated drivers. How Can I Keep My House Comfortable? Believe it or not, people can heat up a house fast. If you want to keep your house comfortable and save on your Texas energy bill, then lower the thermostat a few degrees before guests come over. All the excitement will warm up your house quickly once the fun begins. An easy way to do this is to set your smart thermometer to adjust automatically before your guests arrive. And if you don’t have one, then a smart thermostat electricity plan will pair you up with one along with cheap energy rates. How Can I Find the Cheapest Energy Rates in the ONCOR Area? Remember: you have the power to choose. For more information on finding the cheapest rates in Dallas, check out www.TexasElectricityRatings.com. There you can compare, shop, and switch to the best electricity plan for your specific needs.